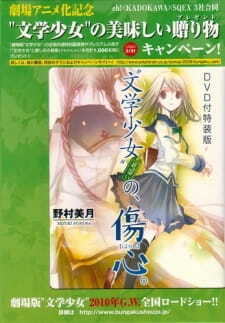 Short episode bundled with the limited edition release of "Bungaku Shoujo" Minarai no, Shoushin. After watching this today I just really felt like writing a review. Bungaku Shoujo no Kyou no Oyatsu ~Hatsukoi~ (which I'll just call Bungaku Shoujo or something else in case I want to repeat it again) is pretty much a preview of what the movie will be. Well that's what I would mostly guess as I have never touched its source material so any plot spoilers will be totally absent here. Amano Touko catches Inoue Konoha spotting her eating paper and she forces him to join the lonely Literature Club. As intriguing as that sounds, if you're actually looking for a plot, or any hint of it for the upcoming movie, you'd be so thoroughly disappointed you'd say this is a boring boring filler episode. And that is definitely right, this is a filler episode. Not only is it nicely done, its charismatic characters charmed me throughout the whole episode. Of course, if you get bored easily (mostly out of slice-and-life), this one's probably not for you but for some it's a real treat. I've always loved light-hearted and relaxed slice-of-life stuff and this is a gold mine of it. It was fun and totally carefree, think of any series that engages/uses your mind too much, like a really intriguing mystery series that even has pretty dark graphics. Now think of the polar opposite. It would be probably an anime that's somewhat too light-hearted, relaxed and probably too soft, that is probably Bungaku Shoujo (well, the preview at least). And a nod to the art; I really loved it. Although it hadn't stunned me by a lot, it did enough to earn a lot of recognition from me. Looks like Production I.G. 's gone out of its way to produce some good stuff here. The soundtrack is also very enjoyable. While it's not incredible, it's not bad or misplaced either. Each piece was used well and I especially loved the opening and ending pieces for this. The whole main story here is about Amano Touko telling Inoue Konoha to write her snack, something having to do with a love story and some unrelated objects. As he writes, Touko talks on about the story she was reading, First Love by Russian writer Sergeyvich. Soon he finishes up and lets her eat it which to her dismay had a pretty bad end. Not quite a deep story is it? People have criticized the move on discussing the book too much but personally I don't mind, the happy-go-lucky nature of Amano Touko kept entertaining me but I can't say too much about Konoha as he was never explored too deeply. This gives way to many paths the writer could use for the two and this will probably be explored more in the movie, or maybe this preview was instead a look at their everyday lives in the Literature Club after or during the period in the movie. Another point that made me love the concept of this is Touko's taste buds. As someone who enjoys writing stories, having Touko as someone to get feedback from must be really something. Would probably the best book critic ever if she chose to be one. In short, Bungaku Shoujo no Kyou no Oyatsu ~Hatsukoi~ would be a very enjoyable preview if you love those relaxed, light-hearted slice-of-life atmospheres. Along with this, the fuzzy atmosphere is accompanied by a thoroughly enjoyable charismatic girl, good art and her re-imagining of the stories she's reading. Its slice-of-life feel may disappoint you or it may entertain you and you may even end up wanting more, as I had felt, but the final judgement should rest on the movie version and not the preview even though I enjoyed it a lot. Thoroughly recommended for anyone and everyone looking for something truly light and relaxing. I'm not sure what to say about this one, because there isn't much to it. But to be fair to it, there is only one episode and it wasn't that long to begin with. Story: There really wasn't one. There is no beginning middle and end. This is just one episode about a boy who got dragged into a literature club because he catches a girl literally eating a book. Then she wants him to write her lunch. That's about it. The majority of the story focuses on the literary works of a Russian author, instead of on the main characters. At first, I thought it was going to be a slice of life story with a little of the fantastical (maybe), but instead, it is a narration of stories that the girl eats like delicacies. Also, there were a few unnecessary scenes that just ended up being filler without any explanation. Characters: I honestly don't know what to say. There is no character development. You hardly even get to meet the characters. The show spends more time talking about literary works and the stories contain there in instead. Sound: 6/10 Not much to complain about. Not much to contribute to either. The sound score was soothing, but soothing plus boring script, equals time to sleep. Art: Pretty. I would give it an 8/10. I liked the art style for the most part, but if you want serious bishie art, this isn't it. Basically, in a nut shell, I am disappointed that this is my first review here, because there is nothing much to say about it. The anime just doesn't have much to it.